Individualism – the word which is being analyzed by the philosophers since a long time. Yet it hasn’t achieved a perfect meaning as thoughts vary and everyone prefers to interpret it in his own way. However, one thought over which everyone might agree is that individualism is a social stance of independence. This word emphasizes more on the independence of an individual, than anything else. It is a righteous way of living as well. After all, who owns us more than us? Obviously us. We are born free as a child in this world, unaware of everything. But as we grow up, we build up our own thoughts, and are formed by our perception. The society, people around us, the environment that we live in, and the morals that we learn, everything is slowly injected in our mind and heart. Or else why would we believe anything? But we find truth only when we think ourselves and discover it. Often, we’re made to feel like the slaves of this world, and when we start living like one, it makes us feel weak. We feel hurt. We feel like we’re being controlled when we actually want to be set free. Individualism is capable of setting you free from that slavery. If you weren’t ever taught a single thing about religion, would you have believed in it? Would you have believed all the rituals and religious practices? Not at all. If you weren’t bound by the social ethics and morals, would you be living the way you are living now? Your obvious answer might be a no. If given a chance, won’t you like to act according to your will, take every decision by yourself, and have the freedom to things as per your wish? Who doesn’t. Don’t you feel uncomfortable by being trapped in so many rules and formalities that exist around you? Yes you do. If you agree with even a single thing in the above mentioned points, then it clearly is a positive sign that there’s a desire within you to achieve freedom and be independent. Or in short, you want to be set free again. Don’t you notice the unnoticeable things around us which control us, govern our life, and have become a fake part of the real us. Whether it be the rules of the government, laws, social hypocrisy, general formalities or something else. Even since our childhood, we’ve done one thing very well, and that is believing everything just because we are trained to believe it. We do it because we don’t know much at the earlier stages of our life, and thus we believe in whatever we are told. Perhaps we were the novices in the game of life who lacked wisdom. The main ideology in individualism is that a person must act independently, and thereby should make decisions for himself while staying unaffected by the social norms. However, its not always easy to stay independent even if you are born independent. You’re likely to be affected by your surroundings as you stay in them. Your surrounding acts much like gravity. It pulls you, it holds you, and doesn’t allow you to stay unaffected by it, but somehow we need to escape it. To say in a simplified manner, everyone has the right to act for himself, and do what he wants to do. But the external forces prevent us from doing this. It isn’t just of others to bind you in chains. There comes a time we can tolerate no more the fact that our life is being spent in vain, and thereby we become rebels. The true joy lies in choosing your own paths, instead of being guided on the weary ways. Joy is in freedom, and to have a right to decide for yourself, the wrongs and the rights. Individualists often forget that others too own themselves as much individualists own themselves. An individualist has the right to do what he wants to do, until it harms someone else or is an act of defense. Also, it isn’t right for an individual to engage himself in any activity which could ruin him or is a misuse of the independence. However, some individualists fail to understand it though. Yes you are born free. Yes you are free to make your own decisions. So what? this doesn’t mean that you are given a moral right to establish your own superiority by harming others. Yes its your life, but you cannot ruin it by engaging in unethical acts. So what you must know is that individualism is one of those many things which have both good and bad sides. It doesn’t promote any kind of permanent way of living. Individualism can be discussed endlessly, and a lot can be explained about it without arriving on a proper conclusion. Individualism is just a term which all people use in their lives, either knowingly or unknowingly. The start of individualism takes place when a person decides to do something by his will and is opposed. In such a situation, he prefers to be on the side of his decision as it is more important to him. Due to this, he may break some rules and go against some morals. Therefore, conflicts may arise between society and the individual. This makes him shun the society as it isn’t being on his side, and it seems unfair to him. However, individualism doesn’t always give rise to conflicts between the society and the individual. If most of the decisions of an individual are accepted and fulfilled by the society, will there remain any reason for conflict? This shows that we notice the individualist psychology of people only when there is some kind of disagreement between the individual and society, whereas the truth is that some disagreement always exists. 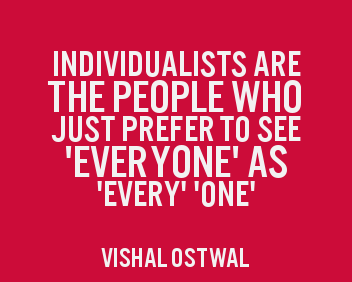 Why should one be an individualist? In this world, it’s easy for us to lose our own existence, but it takes a lot of courage to be what we are. Also, the bliss of freedom is undeniable. It makes life meaningful and worthy. How great it feels when we stop being slaves, and start becoming masters of our own. How great it feels to take a stand for oneself and own our own deeds and destiny. As humans, we are meant to keep progressing and walk new ways instead of singing the years old folklore. Even if don’t claim to be an individualist, there’s one existing inside you, reminding you of your own existence, happiness, and freedom. We are all already individualists, since we are born free. Just using or not using the word individualism changes nothing. Individualism is just another form of freedom and a way of living which allows us to rise for ourselves and make appropriate decisions. We’re all individualists since we were born. Sometimes, when you’re right, there’s nothing wrong in going against the society and attempting to bring a reform. Be yourself. Make your own decisions. Break some rules if needed and strive for good.